Before our first SAG we got the opportunity to say hi and take a picture with Don's 93 year old mom in Hermosa Beach. It's a great stop and really a special experience. Then we moved on down the coast taking our first SAG at Torrance Beach, then I diverted to ride around part of the penninsula of Palos Verdes to my old house where I grew up. I really haven't seen it in years, and even longer standing in the gravel parking spot out front on a bike. The house I grew up in... still has ivy in front. Then on to climb over the hill, down our favorite road Anaheim street, with it trucks, Petro business, shipping business, and trucks, and nasty roads, and trucks, and gang bangers, and trucks. It's pretty awesome riding experience. I heard someone say something as they drove past like 'And you brought your women down here on your fancy bikes? You guys are crazy!'. Nice. 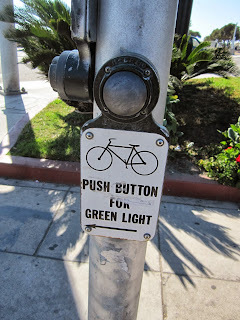 But we were soon through Long Beach and into nicer beach communities as we wound up down PCH to Dana Point. Wow. Today seemed longer than the mileage shows. Just from the stress of the traffic. There's a reason I decided not to start my ride north from San Diego. So I wouldn't have to do this part of the ride twice! 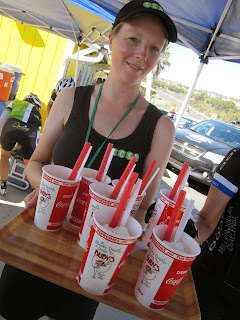 The last SAG had shakes.... Jo was very popular! Tomorrow is the last day... Can't believe it!